Pat Liskey and his Big Twin Diesel team have been racing up and down the west coast all season with NHRDA, winning round after round. 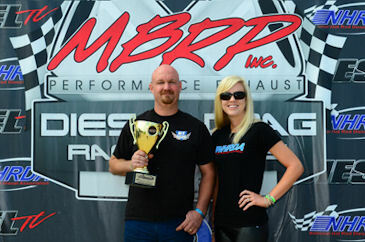 Liskey has been to four final rounds this season and that has helped him secure his first ever MBRP Diesel Drag Racing Series National Championship. Liskey capped off a great summer with a huge win at the Canadian Diesel Shootout as he was able to put a stamp on his first ever National Championship.